Kentucky is known by many monikers: The Bluegrass State, site of the Kentucky Derby, birthplace of Abraham Lincoln, home of the Corvette and Land of 10,000 sinks. One of the more famous sinks can be found in Mammoth Cave National Park and is named Cedar Sink. Visitors to the world’s longest cave (over 400 known miles) will find this major geologic feature worth exploring. In case you’ve never heard of a sinkhole, it’s where a cave passage has collapsed and left behind a surface depression. This is the primary feature of “karst” topography. Loosely translated karst means “sinkhole plain”. If you were to fly over central Kentucky at low altitude, the surface would appear “dimpled” like an orange, or a golf ball. Cedar Sink is a classic example of a sinkhole. Though the scope of this feature is hard to see with summer foliage concealing its size, during the winter months it’s truly a “sight to see”. 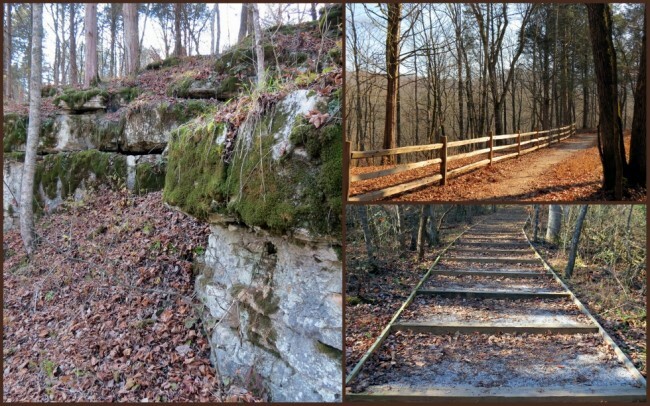 The trailhead is located on highway 422 inside the park near the community of Pig (no kidding). The semi-loop trail is one of the better trails in the park, meandering through a hardwood and coniferous forest. Along the trail you should take time to study the numerous seasonal wildflowers that will line your path. During the summertime you can see: Wild Quinine, Brown-Eyed Susan, Slender Mountain Mint and more. 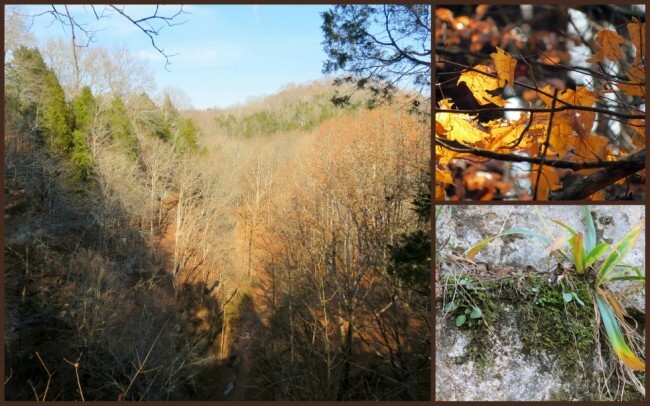 In the winter you’ll find a variety of ferns, moss-covered trees and rocks bringing color to the normally bland landscape. Spring and autumn both offer other varieties of plants, too numerous to mention here. If you’re a plant lover, I suggest that you purchase a copy of “Wildflowers of Mammoth Cave National Park” by Randy Seymour at the Visitor Center. 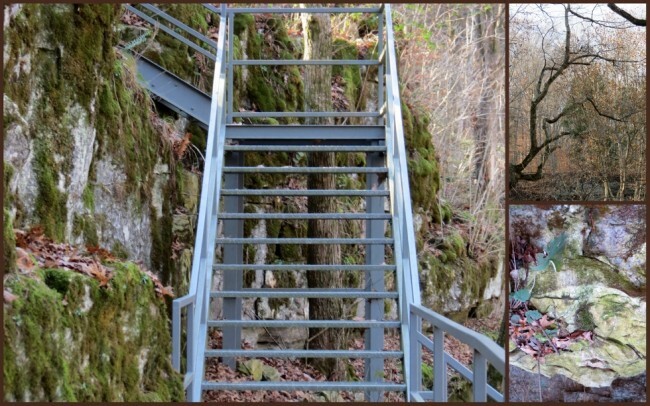 One of the more interesting things about this trail is the abundance of complicated staircases transporting you up and down into the sinkhole environment. 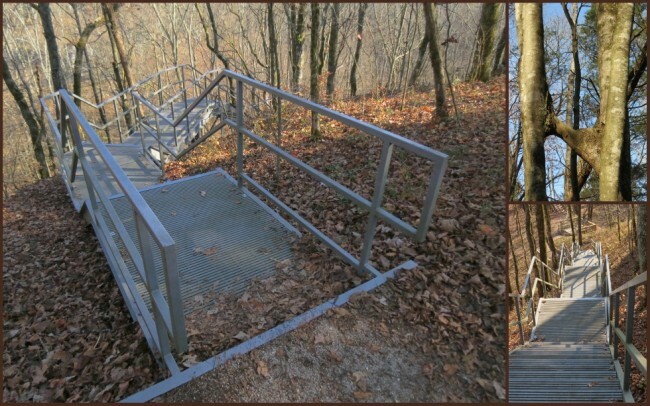 These wonders were carefully constructed to allow for easiest access into areas that are normally dangerous and difficult. The hike itself is fairly easy with gentle ups and downs along a gravel-covered trail. There are several areas with steps to make the grades easier to handle. You’ll also find rest areas along the way, one about halfway and the other at the end of the hike. 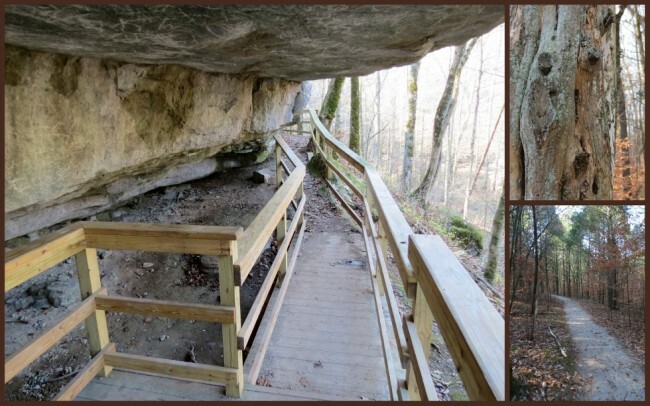 Take some time to sit, enjoy the numerous overlook platforms and study the massive stone walls near the sinkhole. During wet times, you’ll be treated to a stream below you, routing water into the cave beneath. 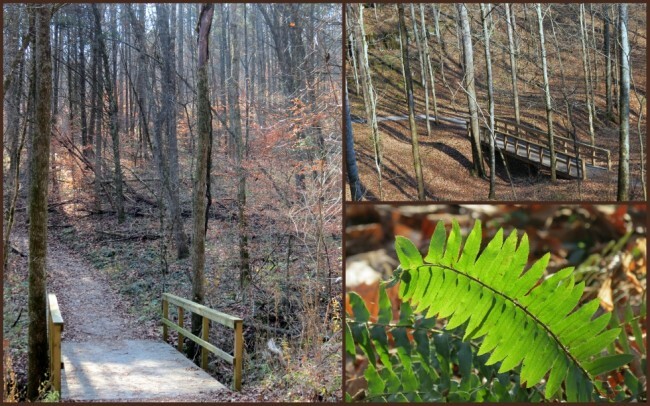 If you’re looking for a perfect, easy and short getaway from the large crowds which visit this very popular national park, the Cedar Sink Trail is for you. Last modified on: July 14th 2013.